The Features Some tips and suggestions about drawing the elements that make up the face. This month the mouth. 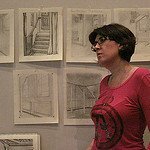 Learning from Other ArtistsThe benefits of visiting and drawing at an exhibition. "What did I learn? Well, that in fact I can draw! And so many things... that drawing is a long and often hard process and that's okay! That practice, patience and trust in the process are vital! Drawing the mouth can be tricky as we have such a strong symbol in our minds for this particular element of the face. Find out the position of the centre line of the mouth by sighting down the face. You can relate it to the position of the eyeline, the bottom of the nose and the bottom of the chin. I’d recommend you sight using one reference and then doublecheck against the others. A common problem is to place the mouth too low. Consider the position of the mouth in relation to the bottom of the earlobes and also to where the neck joins the head. There are so many different ways to find the same information. Don't try and draw the outline of the upper or low lip. In general I’d recommend ‘Less is More’ – leave something for the viewer’s imagination to fill in. Whether you are visiting a special exhibition or just looking at works of art in a permanent collection, you can learn so much. Reproductions are never perfect and seeing the colours and the brushstrokes for real can never be bettered. It's always worth seeing if you can draw in an exhibition and then with a sketchbook, just exploring for yourself by copying a work of art. It's not about producing a copy but rather taking the time to look and experience how an artist used the space, created the composition and so many other decisions. If you are copying the work, you'll be experiencing a similar process so try it - but always check in advance what is allowed!Don't forget too that many museums will run workshops and other events which are often worth exploring.